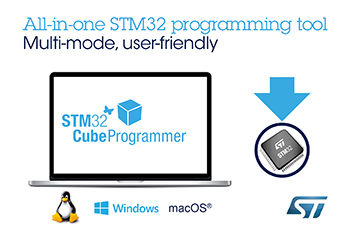 Ready to run on Windows®, Linux, or MacOS® operating systems, the STM32CubeProgrammer can program the STM32 microcontroller’s on-chip Flash/RAM or external memories using various file formats. Further capabilities include whole-memory or sector erase and programming microcontroller option bytes. Users can also generate encrypted files for secure programming (Secure Firmware Install/Update) to authenticate production and protect intellectual property. Furthermore, the STM32CubeProgrammer provides many opportunities to customize and configure features, using either the Graphical User Interface (GUI) or the Command-Line Interface (CLI). Also, this all-in-one tool can be used in standalone mode or integrated and controlled from a custom application. Programming can be done manually or automated using scripts.